It appears that Citigroup employees in New York City just aren’t that into the pizza being served in their cafeteria. 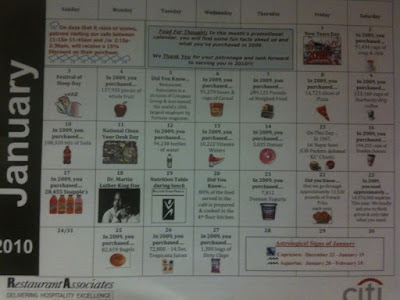 Last week, I went to visit a friend who works at the Citigroup headquarters in Tribeca and I came across a promotional calendar featuring statistics about food purchased by employees in the building cafeteria. 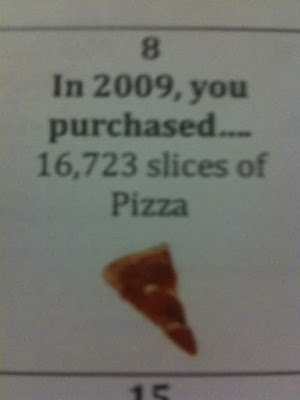 In 2009, only 16,723 slices of pizza were purchased. Let’s break this down. The building has 39 floors and according to my friend approximately 200 people work on each floor. That’s 7,800 employees in the building. Let’s assume that an average pizza lunch would include two slices of pizza. 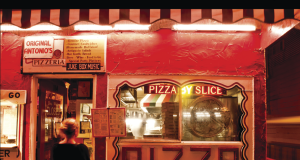 That means that only about 8,361 pizza lunches were consumed by employees last year — or 1.07 pizza lunches per employee. That’s over the entire year! Are there any employees or people who’ve eaten at the Citigroup cafeteria who might be able to comment on the quality of pizza served there? Let’s look at these numbers another way. There are 260 weekdays in a calendar year and about 250 after you account for national holidays. Assuming there are eight slices in a pie that means that only about 2090 pies were made in 2009. That’s 8 pies a day. So of nearly 8,000 people in the building on a given day, only about 32 people (getting 2 slices each) have pizza for lunch. Wow. How does this compare to other items? 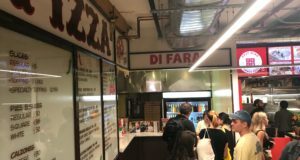 Well with 108,320 bottles of soda purchased (14 per employee), 137,935 pieces of fruit (18 per employee), and 95,279 boxes of cereal (12 per employee), it seems that either (a) the pizza at the Citigroup cafeteria isn’t so great or (b) Citigroup employees are just not that into their pizza. 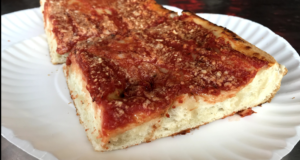 Previous: Yeminite Food Bar In Safed, Israel: What Is Pizza Anyway?